The world gets inside of John Gibson’s electronic compositions, one way or another. Whether it’s the scrape of a kitchen knife or the cacaphony of a street scene, he brings everyday sounds into his musical orbit. Gibson grew up in Atlanta playing guitar in rock and jazz bands, but eventually was drawn to contemporary classical music. Having moved from purely instrumental work to electroacoustic music, he retains an obsession with harmonic color and rhythmic pulsation, while broadening his palette with transformed instrumental sound. 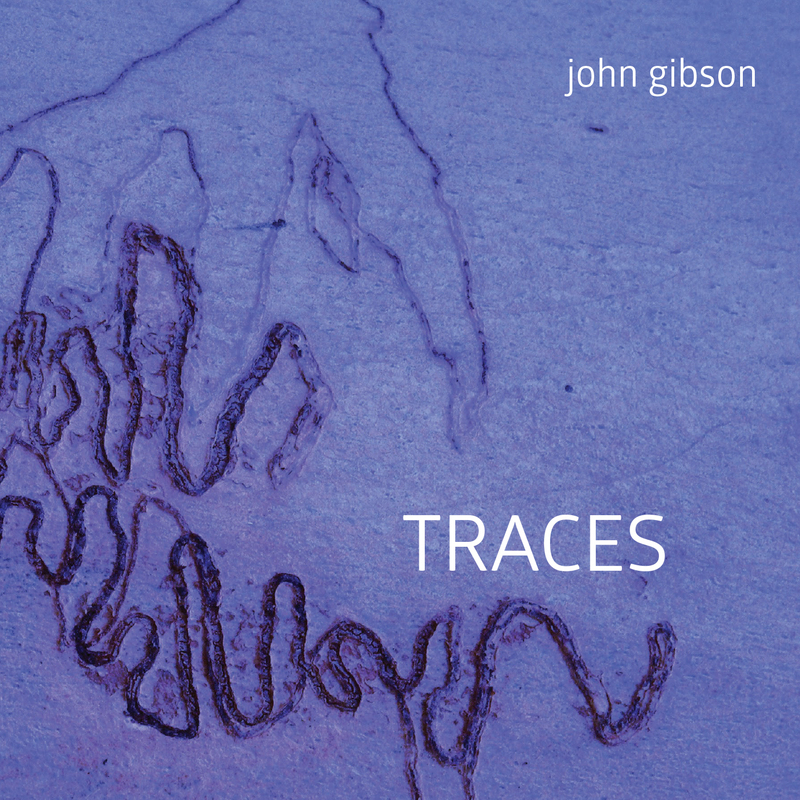 On Traces, the pieces range from minimal to maximal, combining live instruments with pre-recorded soundtracks and improvised responses from the computer. “Thrum” and “Slumber” take notes played on familiar acoustic instruments and assemble them into hypnotic grooves and atmospheric textures. “Day Trip” draws on heavily processed soundscape recordings from New York’s Chinatown, and “Driptick” orchestrates the clash of incompatible speeds projected by the sounds of dripping faucets and ticking clocks. For the rest of the album, pianist Kati Gleiser, cellist Craig Hultgren, and brass duo Brett Shuster and Michael Tunnell join Gibson in studio recordings of pieces they commissioned. These pieces employ Gibson’s custom software, which allows the computer to manipulate sound produced on the instruments, as well as make decisions about when and how to play music in response. In “Out of Hand,” the computer listens to Shuster and Tunnell, shaping the electronic accompaniment it produces on the spot. The musicians lead us across several contrasting landscapes to a final passage featuring the duo expanded into the sound of a full horn section, set against an algorithmically generated funk bass line. “Red Plumes” is a sonic metaphor for the giant tube worms that grow in the path of hydrothermal vents deep in the Pacific Ocean. Craig Hultren’s cello provides source material for the electronic part that accompanies his soaring melodic lines. “Blue Traces” is a meditation inspired by the bioluminescence of sea creatures. The computer makes brief recordings of the piano during the performance and fashions them into a gentle backdrop for the artistry of Kati Gleiser. Gibson’s compositions have received performances by the London Sinfonietta, the Da Capo Chamber Players, the Seattle Symphony, Speculum Musicae, and at numerous festivals, including Bourges Synthèse, Seoul International Computer Music, Brazilian Symposium on Computer Music, as well as many SEAMUS and ICMC conferences. He teaches composition for electronic media at the Indiana University Jacobs School of Music.